← Yarmulke + Ketubah, Perfect Together! Few things could be as thrilling as seeing our couples featured in the New York Times–and getting a shout-out for our Ketubah! Could we ask for anything more phenomenal on an otherwise relaxing Friday afternoon? This Is Not a Ketubah was extremely excited to read that one of our fantastic Commissioned Ketubah couples was featured in the New York Times Vows section, and we couldn’t be happier for them! As a dynamic duo of writers and editors, Jennifer & Jason asked Team Ketubah to create a design inspired by their love of writing, literature, and books. With a stylistically antique flair and the Ketubah text positioned as if it were on the page of a venerated book, we worked with the couple on several drafts until we could create the perfect custom Ketubah, just for them! Flanked by bouquets of orange roses, tulips and dahlias, they were married Oct. 29 at the Fairmont Hotel in Washington under a canopy supported by four white birch branches. 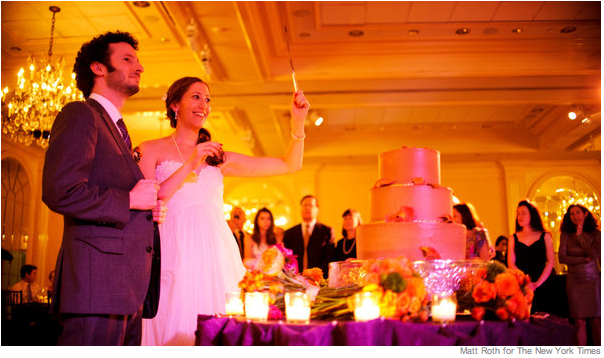 They read from an appropriately antique-book-styled ketubah, a traditional Jewish marriage contract, and their reception dinner centerpieces were concocted from classic books. We recommend you check out their NYT video, too. It’s just too cute! Of course, Team Ketubah is thrilled to have been a part of such a fantastic wedding, and we wish Jen & Jason nothing but pure marital bliss. You can check out Jen’s forthcoming book The Year of the Gadfly in May! How’s that for pre-Shabbat excitement? !